This year, we’re trying something new. This is the night that Christ gathered with his disciples in the upper room. Come gather with us for a potluck meal in the Church Hall at 6:30 pm, ending with stripping of the altar in the Church. We need to know numbers, so please let us know you’re going to be there. This is the night that Christ took a towel and washed his disciples’ feet. Come join us and remember the example of being served, so that we might do to others as he has done to us. This the is night that Christ gave us this holy feast of bread and wine. 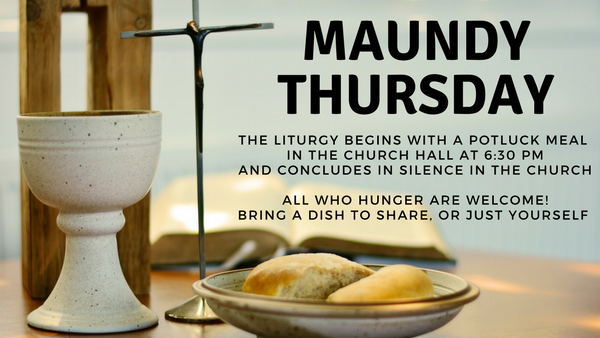 Come join us as we eat the bread and drink the cup that proclaims his Holy Sacrifice. This is the night that Christ the Lamb of God gave himself into the hands of those who would slay him. Come keep watch with us and remember that Jesus gave his disciples a new commandment, to love one another as he first loved us.